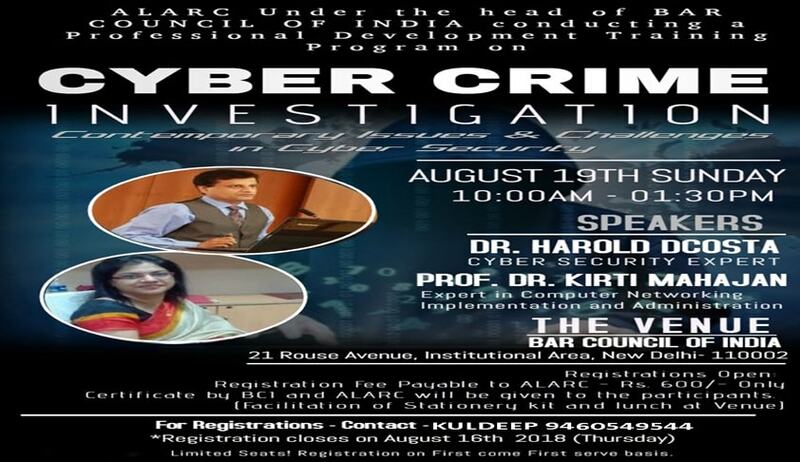 AIR Law Academy & Research Center, in collaboration with Bar Council of India (BCI), is conducting a professional Development Training Programme for students, professors, academicians, research scholars and advocates on Cyber Crime Investigation (Contemporary Issues & Challenges in Cyber Security). Harold D’Costa, CEO & Principal Consultant Cyber Security of Intelligent Quotient Security System. Dr. Kirti Mahajan, Director, Students’ Welfare, Bharati Vidyapeeth University, Pune. For registration, contact Kuldeep Singh (+91 9460549544).